Today we’re looking at the very first piece of fan mail ever received by DC Comics about Firestorm! Comics reader Mitch Senft holds the distinction of having the first published letter about the Nuclear Man. Mitch’s letter was very honest and pointed out some highlights of the book and some concerns he had with the character. Check out the letter’s page below from Firestorm vol. I #2 (Apr. 1978). As noted in the letter column, the letter was received in October 1977, more than a month before the first issue hit the stands! 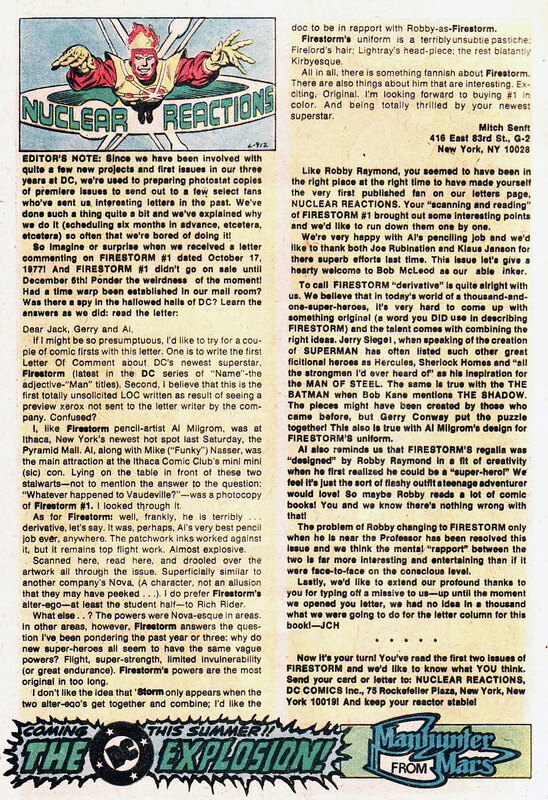 Also worth noting, last week we published a promotional piece from Nov. 1977 hyping the upcoming release of Firestorm #1. In that article, Professor Martin Stein is referred to as “Charles” Stein. Well, turns out Martin wasn’t the only one back then with an Identity Crisis (yes, pun intended). Throughout the letter column below Ronnie Raymond is referred to as “Robby” Raymond. I can understand the fan letter misidentifying him as “Robby”, but editor Jack C. Harris too? Makes you wonder if this was simply an error, or if the character was actually named “Robby” at some point prior to the release of the first issue (a possibility Gerry Conway recently suggested). Check out the letters page below. Click to enlarge! Not sure how the mix-up occurred with Ronnie’s name, but certainly makes for an interesting time capsule. About all I remember was being at a small convention around Ithaca where Milgrom and Nasser/Netzer appeared. Milgrom had a B&W copy of Firestorm #1, and I was intrigued, intrigued enough to send off a LoC [letter of comment] — which is something I did few enough times to count on the fingers of one hand. The book came out, you might note, during the brief time Gerry Conway was editing at DC. Can’t remember if this was immediately before or after his eight minutes as Marvel EIC [Editor-in-Chief]. In any case, part of his job, I believe, was to create a bunch of books that were Marvel-like — of which Firestorm was very clearly one. My thanks to Mitch for responding to my request and providing feedback on a letter he wrote over 35 years ago! Thanks, Mitch! Also, my thanks to fellow blogger Anj for digging up this letter and sending me a scan! You can check out Anj’s fantastic Supergirl blog by clicking here! Posted in: Al Milgrom, Firestorm #01: Original (Ronnie/Martin), Firestorm comic vol. I, Gerry Conway, Professor Martin Stein, Ronnie Raymond. I’ve had the issue that this appeared in for years and I never quite understood what Mitch meant by “I’d like the doc to be in rapport with Robby-as-Firestorm.” Can someone translate what he meant by this? That he wanted Martin to be aware of being Firestorm? That a floating-head persona of Ronnie should appear with the floating-head persona of Martin above Firestorm? @Martin Stein Returns (Love the new handle, Robert!) – Go back and re-read the first issue. Ronnie and the Professor’s personas were somewhat merged. They could separate personas temporarily to communicate with each other, but it was more like one gestalt being. It changed by the time issue #2 came around. Right. The floating head didn’t come about until the second or third issue, as I recall. That makes sense. Oddly enough, in a sense they sort of went back to the “gestalt” with the blank slate Firestorm, and his two alter egos both getting floating heads. Mike Nasser (artist on the Adventure Comics Manhunter from Mars back-up strip and designer of the pictured logo) was at the same con as Milgrom (who drew the cover of The Comics Reader issue announcing the planned Manhunter from Mars series hyped here had been devoured by the DC Implosion.) Trippy. As I have mentioned before, Firestorm has a strong place in my comics collecting foundation. So I was glad to share! Also, I remember Firestorm trying to get romantic with Power Girl in the old JLA/JSA team-ups so I have always wondered if a romance would ever be explored between Supergirl and him.